A different type of training today. So the training needs to be done and there will be lots of it. Keeping motivated will be the key which is why tracking my progress on Strava will help, as you can join challenges and set yourself goals as part of your training plan. From my reading well training should also include different types, cross trainer in the gym etc to smooth out any muscle imbalance, but also to break up the same of stuff. You need to exercise and train the mind as well as the body. So today I hot a personal milestone. Regular readers (all 3 of you) will know that I am not a runner. Unlike @onevbusyman I am not training for the London Marathon so don’t need to spend hours pounding the pavement, but today I decided I would have another crack at running a 10k! To add to this I set myself the challenge to see how close I could do this to one hour and hopefully under it. The headphones were plugged in and I was off, gratefully assisted by the Prodigy which I have to say helped me keep a steady pace which was much quicker than I have run before. 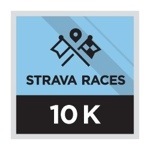 So with Invaders must die pumping into my ears I was able to complete my first 10k and have it record properly on Strava ( the previous attempt was recorded at 9.4km and that hurt being defined the distance) and in the process gain my first digital badge, yes I feel good! I know that the use of Strava will be a valuable part of my training as I prepare for Ride London. I will see my fitness improve as the weeks and months roll by and hopefully I remain injury free and don’t suffer any hick ups along the way. With me feeling good and the first small milestone achieved, plus the bike saved from the floods earlier in the week it is time to get some rest before a ride in the morning, just to get the legs working once more. Enjoy your rides this weekend whatever and wherever you’re riding. This entry was posted in Cycling, Running, Training. At this time of year you get many “Reviews” of the previous year. Well 2013 was the year that this blog was born and I thank you all for your comments and time spend reading my posts. The blog will continue into 2014 and this is where I wish to focus my efforts. 2013 has not been the worst year, and there were some very good highlights, but 2014 is nearly upon us and it is time to get ready. The blog may take a slightly different turn during 2014 this is still to be decided. The focus will remain on cycling and my efforts to once again get into some sort if shape for the sportive’s which have been entered, but also to those events by others such as how @onevbusyman will perform when he completes his first London Marathon (first marathon to my knowledge too!). Go get em mate, but remember to start slow and get slower! So back to the cycling. It have been agreed, but not fully confirmed that in 2014 I will not complete in my third London to Brighton Night Ride and indeed try to complete this ride in under 4 hours. I am sure I will come back to this, maybe in 2015 or later but I believe there are other challenge which should be attempted. Instead of the London to Brighton, on the very same evening in fact, I will join the band of happy cyclists who will be “doing the dun run”. This does not mean running to the dunny for any Aussie readers, but in fact cycling from London to Dunwich on the Suffolk coast. This is a big 120 mile ride an will involve cycling for about 8-10 hours. Let’s hope that @onevbusyman has got his legs in order after his marathon exploits so he can join me on this adventure. I know I’ve a long way to go to catch up on the fitness but the new year will being in a new plan. Saying that if anyone else is doing the Dun run then get in touch and we can compare notes. Well more like me steel the good ideas you have and use these to improve my own performance on the bike. When I indeed return to work in January I will renew my gym membership which will allow be to access the. Excellent facilities at work, mainly before completing a full day, but allows me to build the strengths and the cardo work before the longer rides in the late winter and early spring. The plan has had to be changed due to an injury to my right knee which is still painful but thankfully is healing fast. As a result I will be using swimming as a low impact recovery for my knee and at the same time starting to build the general fitness to where it needs to be. Also with some organisation the rides to work can start again, probably in late February, just to get the bike handling skills up to speed. The one area I need to improve and then maintain is diet. I will need to complete some more research into this area to get the right balance for me and the job in hand. I will feel better for shedding the extra pounds which have been accumulated over the last few months due to one thing or another. Again I would be happy to hear from other people experience in relation to this and what worked for them. Deep down I know what needs to be done and I just need to get out there and do it. Rule #5, just remember rule #5! It is also hoped that I will also gain a place in the second Ride London 100 in August. As mentioned in earlier posts I am in the ballot and will have to wait until February to find out if I am one of the successful ones. I am crossing everything as I believe this will be a once in a lifetime opportunity to cycle some of the 2012 road race course on closed roads. Something us amateur riders can only dream of. At this stage I am not riding this for a charity but If successful I am sure I will combine the two to raise money for a good cause. I have a few to choose from. Then there is the possibility of the work cycle challenge to cycle to a UK location beginning with the letter “L”. L is the chosen latter as it is the start of the organisation I work for and a friend of mine did a similar thing last year. Another idea stolen from somewhere else! Well that is my “review” of 2013 which is more a plan for 2014. No New Years resolutions here just a plan, a published plan, to help me get organised and remain motivated to complete the goals I have set. I have done so in the past and will do so again. It looses a long way off at the moment but I am sure I will do myself proud and but in a good performance. If not and I feel there are improvements to be made then I’ll just have to go and beat them. It now just leaves me to say a Happy New Year to you all and I hope that 2014 brings you everything you want it to bring. And if you think it is getting to difficult, remember rule #5! This entry was posted in Cycling, Fundraising, Running, Training.